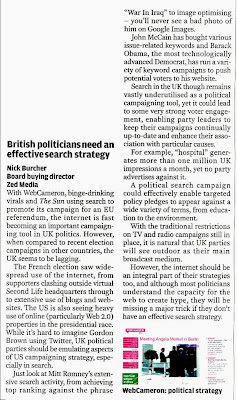 I have written various posts recently about UK political parties' internet strategies and today Media Week published a letter from me on this subject under the heading 'British Politicians Need An Effective Search Strategy." Nick Burcher writes: "With WebCameron, binge-drinking virals and The Sun using search to promote its campaign for an EU referendum, the internet is fast becoming an important campaigning tool in UK politics. However, when compared to recent election campaigns in other countries, the UK seems to be lagging. The French election saw widespread use of the internet, from supporters clashing outside virtual Second Life headquarters through to extensive use of blogs and websites. The US is also seeing heavy use of online (particularly Web 2.0) properties in the presidential race. While it's hard to imagine Gordon Brown using Twitter, UK political parties should be emulating aspects of US campaigning strategy, especially in search. Just look at Mitt Romney's extensive search activity, from achieving top ranking against the phrase "War In Iraq" to image optimising - you'll never see a bad photo of him on Google Images. John McCain has bought various issue-related keywords and Barack Obama, the most technologically advanced Democrat, has run a variety of keyword campaigns to push potential voters to his website. Search in the UK though remains vastly underutilised as a political campaigning tool, yet it could lead to some very strong voter engagement, enabling party leaders to keep their campaigns continually up-to-date and enhance their association with particular causes. For example, "hospital" generates more than one million UK impressions a month, yet no party advertises against it. A political search campaign could effectively enable targeted policy pledges to appear against a wide variety of terms, from education to the environment. With the traditional restrictions on TV and radio campaigns still in place, it is natural that UK parties will see outdoor as their main broadcast medium. However, the internet should be an integral part of their strategies too, and although most politicians understand the capacity for the web to create hype, they will be missing a major trick if they don't have an effective search strategy. I couldn't agree more, it is the only way that the British public will have a say on what really matters. Currently we are only provided with manifesto promises, these are limited and we are not given the opportunity to vote on single issues, only a political party.